Redmoor House is a large holiday cottage in Wisbech, in the fenland county of Cambridgeshire. Sleeping 8 people, Redmoor House makes a fine destination for friends and family - and there's a hot tub, sauna, gym and indoor swimming pool to enjoy. Redmoor House sleeps 8 people in 4 bedrooms, which are made up of 2 king-size double bedrooms, 1 double bedroom and a twin bedroom. One of the bedrooms is located on the ground floor - as is a shower room - which is handy if for those with mobility issues. There are 3 bathrooms at Redmoor House. Redmoor House has lots of things to keep you busy for the duration of your holiday. There is a sheltered outdoor private hot tub, as seen in the photo. You also have an indoor swimming pool so you can start the day with a dip at any time of the year. For the gym bunnies out there, Redmoor House has a cross trainer, exercise bike, multi gym and punch bag in a private gym area. You don't have to be an excercise addict to make the most of Redmoor House though, there's also a games room with air hockey, a pool table and a table tennis. And instead of watching the TV of an evening, you can head to the cinema area with a 170" screen. Redmoor House also comes with a TV and Wi-Fi, with an open fire in the living area. And the kitchen/utility room has a microwave/oven/grill combination, fridge/freezer washing machine, tumble dryer and dish washer. Redmoor House has central heating, with your towels and bed linen included in the price of your holiday. Outside you have a 1½ acre garden, which is mainly laid to lawn. There is a patio area with outdoor furniture and a barbeque. Outside is also where you'll find your private hot tub. You may wish to spend your entire holiday at Redmoor House, there's enough to keep you happy for a few days! However, should you decide to venture out and explore the area, you'll find the Norfolk Norfolk Coast is a short drive away; or head into the King's Lynn for a couple of hours. Cambridge is just down the road, and is well worth a visit. I'd also highly recommend the Duxford Air Museum for a day out. Although Redmoor House is set in rural Cambridgeshire, you have the benefit of a pub, restaurant and supermarket all with a mile of Redmoor House! Holidays at Redmoor House start on a Friday - with short breaks also available on Monday and Friday. 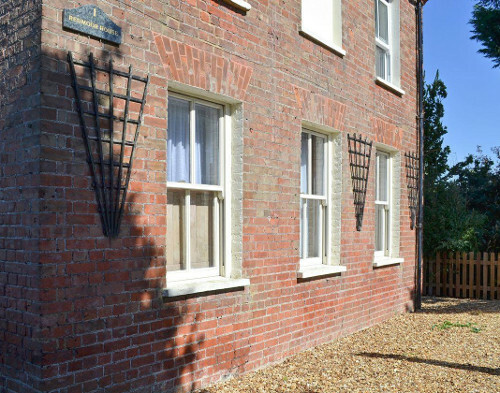 Should Redmoor House not be to your liking, but you fancy staying in the area around Cambridgeshire, you might well be interested in the cottages below. All these cottages are within a few miles of Redmoor House.